Model: VIP CAPSULE / TABLET PRINTER. Designed for printing on tablets, caplets, capsules, softgels, and candies. 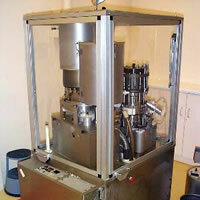 Automatic, suitable for open or closed ampoules. Fully finished in stainless steel, mounted on a aluminium pallet. 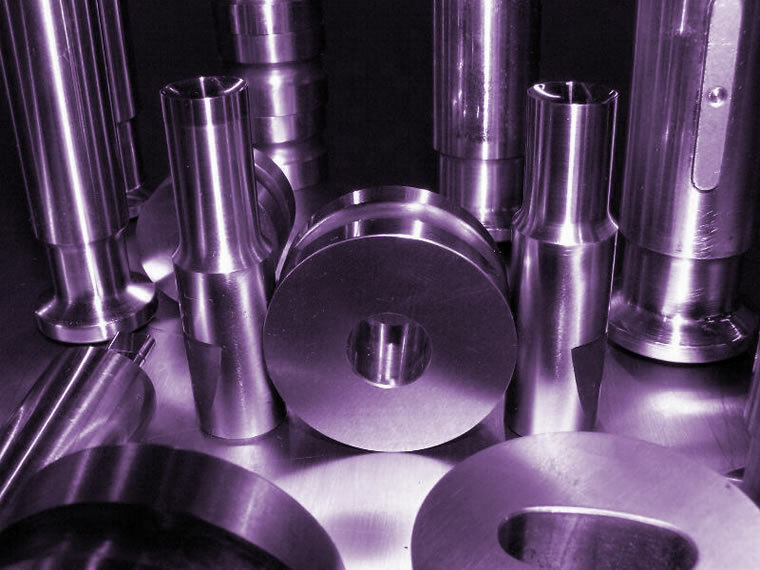 All contact parts in stainless steel. Fitted with an start /stop control safety switch. Safety Interlock Drum Bowl Guard. New Motor. 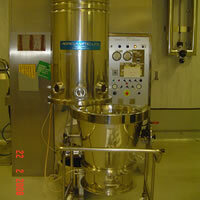 Suitable for wet or dry granulation finished in pharmaceutical Beige. Supplied fully rebuilt. Up to 85 strokes per minute, maximum tablet diameter 22.2mm. Max pressing tonnage 4 tons. 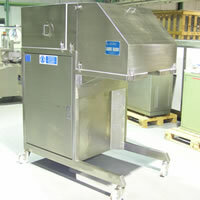 Supplied with steel framed, interlocked guards, conforming to GMP standard. Supplied Fully Rebuilt. Electrics: 380/420v 50Hz 3 phase. Year of Manufacture: 1975. B Type Euro punches Fitted Double Pre-Compression & Keyed Upper Turret. 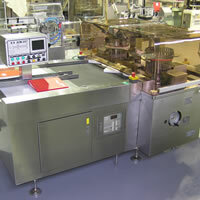 Output up to: 500,000 Tablets per min per hour Voltage: 380/50/3PH. Maximum tablet diameter 15.8mm, maximum depth of fill 17.4mm, maximum pressure 6.5 tons. 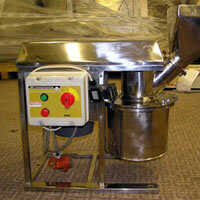 Complete with hopper, both rotary feeders and all round safety interlocked guards Fully finished in stainless steel. Variable speed regulation. 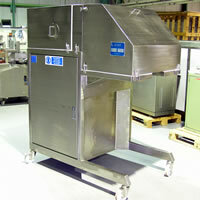 Complete with 2 100 Litre capacity stainless steel bowls and flat beater (the bowl and beater specification can be altered to your requirements. ), with two mobile bowl trucks. Oil damper for lowering bowl. Variable speed by lever operated variable pitch pulleys, fitted with guarding. 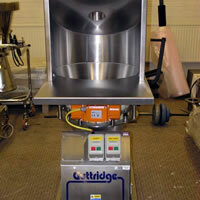 80 Litre Stainless steel hemispherical vessel, jacketed in stainless steel, polish finish internally and externally. 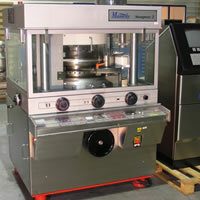 Test pressure 10.5 bar, working pressure 6.5 bar, design temperature 150 deg C. Suitable for full internal vacuum. 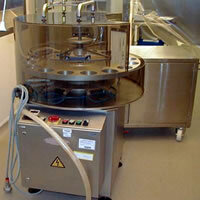 Fully enclosed, fitted with scraped surface, contra rotating variable speed agitators. Agitator speeds:- contra inner 6 to 29 rpm, gate 4.8 to 24 rpm. Bottom entry. 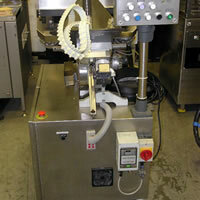 Emulsifier 1500/3000 rpm. Vacuum pump 1 & 2, Emulsifier, Temperature probe, Vacuum pump, Vessel outlet Process timer and Interior light. 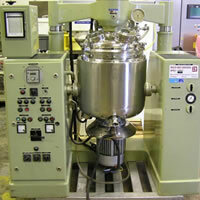 Electrics: 415/3/50Hz Agitators 1.5kw & 2.2kw, Emulsifier, (2 speed) 5.5 & 7kw. All stainless steel chamber with fixed, dual purpose, concave knife/stepped hammer blades, Fitted with flame proof drive motor 12kW. Fully constructed in stainless steel. Screen area: 700.00cm2. 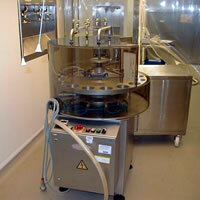 Production output: 225-700kg/hr Suitable for wet or dry granulation. 380 - 420V Renowned for its versatility, multi-purpose functionality, and superior features. 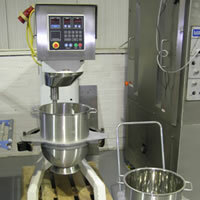 Widely used throughout industry for wet and dry granulation, sizing, mixing and dispersion, pureeing, and size reduction. 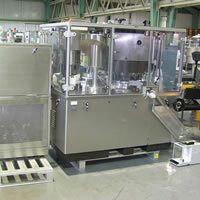 Supplied with sound suppression, and arranged with a dual feed system, one manual the other by vacuum conveying product through the mill for continuous operation. Year of manufacture 1996. 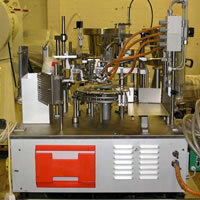 A continuous rotary motion capsule filler, capable of filling capsules for both powder and pellets. 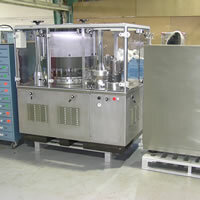 Filling up to a maximum of 60,000 capsules per hour ranging from capsule sizes: 000 to 5 including tamper -proof capsules. 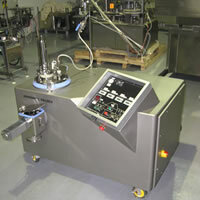 The control system includes the VR Automatic Capsule Weight Control and Monitoring Unit and a Separate control panel with PLC & Includes a vacuum system for capsule handling and cleaning functions. 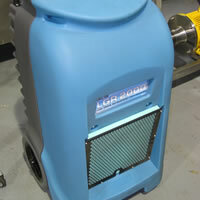 Extremely easy, quick change-over and cleaning thanks to the use of quick release mechanisms. 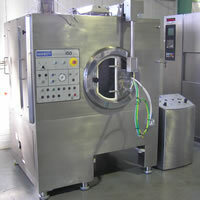 Machine base in stainless steel panels & all product contact parts in stainless steel. 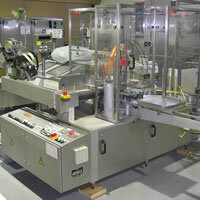 Designed to seal with adhesive tape cases by applying two tape strips on the top and bottom flaps simultaneously. 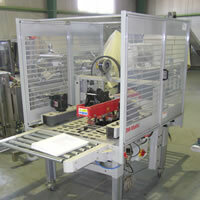 Technical specifications: Operating rate of up to 15 cartons per minute. Power requirements: 230/ 415 V 50 Hz 3 phase 2 Motors (HP 0, 18) kW 0,12 Operation air pressure: 6 Bar Weight: 210Kg. 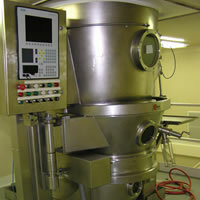 The PHARMA MATRIX is a one pot enclosed batch mixer / granulator, designed on aerodynamic principles characterized by a main bottom-driven mixing impeller and a high speed side positioned granulator. 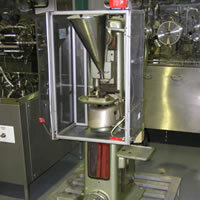 The resultant combination of the fluidised vortex movement of the constituents whilst circulating within the mixing bowl, plus the addition of granulation media provides fast, reproducible granulates. With Blow Back System. 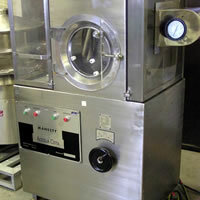 Complete two stainless steel product bowls, Exhaust Air Filter, Air Tank, Steam Air Heater & Fan Peristaltic Pump. 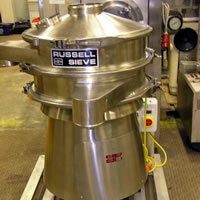 The principle of the fluid bed spray granulators to transform the fine granulate raw material into an even granulate. In the course of this process a suitable liquid is sprayed by means of injection device from top onto the fluidizing product, which causes the particles to agglomerate. 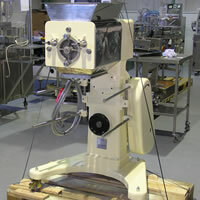 The subsequent drying stabilizes the granulate.